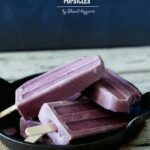 These Blueberry Greek Yogurt Popsicles are a healthy frozen treat to cool down while slimming down this summer! It’s official. My clothes shrunk. I don’t know how, I don’t know why, but it happened. Either that, or all that surplus eating I’ve been doing has finally caught up to me. Remember that operation stop being a fatty I was on back in the winter. Well, it had an adverse side effect. I became a fatty. So although summertime is pretty much the worst time every to try to eat better and lose some fattiness, it’s a necessity. Don’t get me wrong. I’ll still be indulging here and there (and there and there and there). But hey, maybe I’ll actually put one leg in front of the other for an extended period of time now and again. I believe normal people call that exercise. And everyday summer eating? It’s time to make some better choices. Good news? 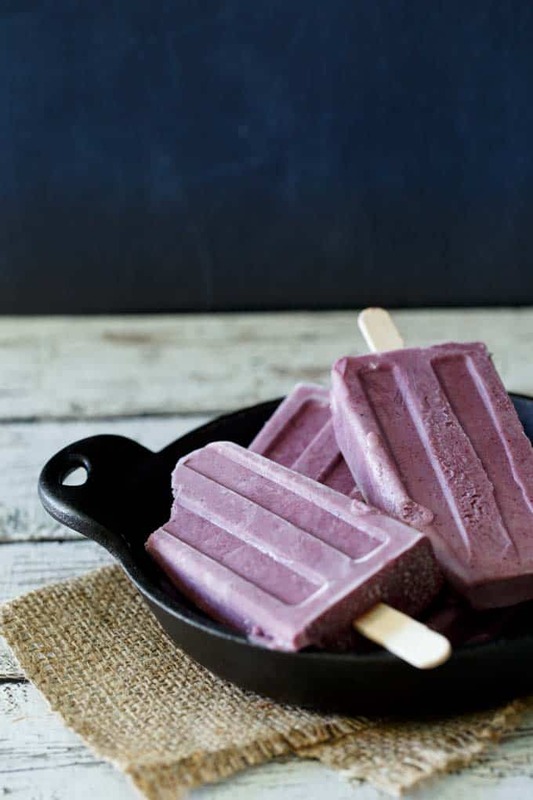 These Blueberry Greek Yogurt Popsicles are a way to indulge without actually indulging all that much. Heck, I may have even had one for breakfast after a recent run (very light jog). This is the popsicle mold that I currently own and am loving. 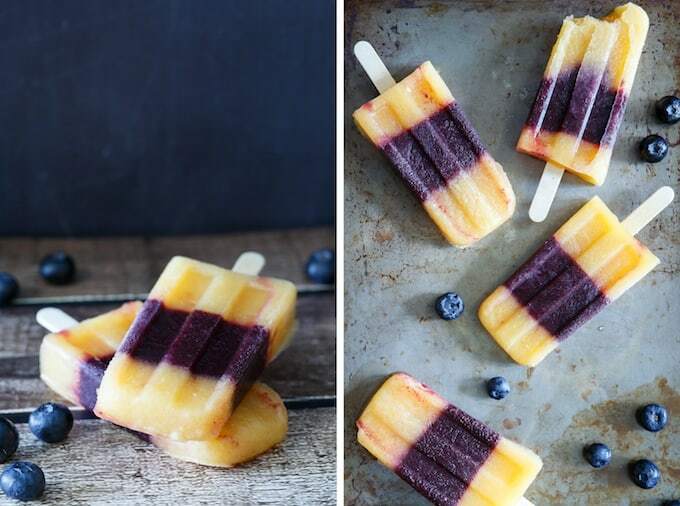 And listen, once you make these bad boys, feel free to get a bit crazy and try these Peach Blueberry Margarita Popsicles on for size. And listen, in the grand scheme of things, these popsicles are a relatively healthy snack or dessert. Heck, maybe not for a superman triathlete like my man Mike. Puree blueberries in a blender or food processor until very smooth. Strain blueberry puree through a fine mesh sieve into a medium mixing bowl. Add yogurt, half and half, sugar, and vanilla extract and stir until combined. Pour mixture into popsicle molds. Depending upon the size of your molds, you can probably fill 4 to 6. If your popsicle mold does not have a lid, cover the top with foil and outline each well with your fingers. Cut a tiny slit in the middle of each well and insert popsicle stick. Freeze for 4 hours or overnight, or until frozen solid. Ready to up your popsicle game? 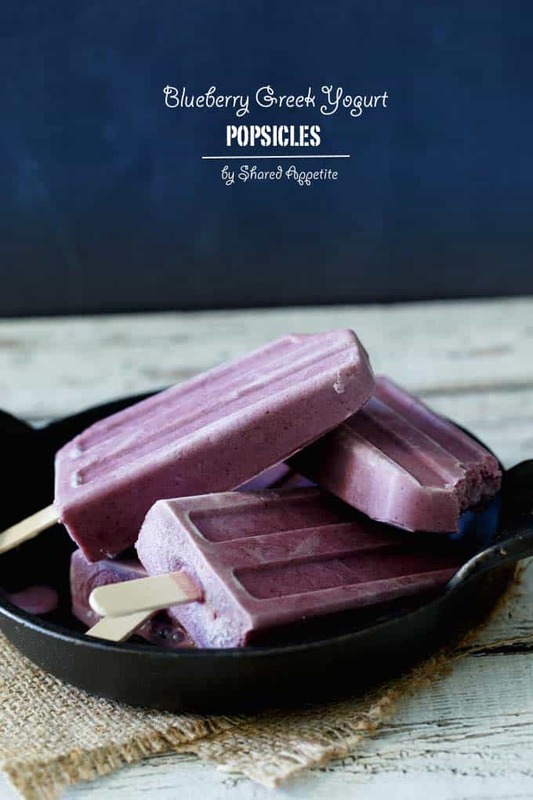 Try out these Peach Blueberry Margarita Popsicles! I lurve blueberries. I MEGA lurve Greek yogurt and I also really like sugar and half and half, because I am a normal human. These looks SO gosh darn good Chris! Pinned! Hahha thanks so much Taylor! Chris, these are so pretty! And I love the flavors. I’m so happy you guys got the keys to your house. So exciting! Of course I love everything blueberry. This is no different. Love the simplicity here. YES! Glad I convinced you to buy a mold haha. There’s so much awesomeness that you can do with all that amazing fruit that your harvest at home and from your farmer’s market and foraging adventures! Oh, yum. And yes, now I want a popsicle mold! Good luck with the weight loss thing (she says while eating chocolate). Hahaha, that’s my problem… chocolate bars on the treadmill. 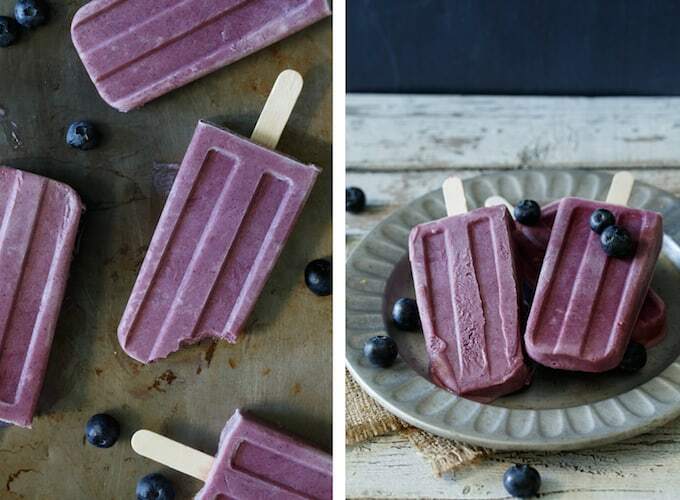 These blueberry Greek yogurt popsicles are bursting with vibrant color and goodness of healthy antioxidants. How can one resist them? These look absolutely awesome, Chris!! Love the flavors, can’t wait to give them a shot! Oh, my clothes shrink all the time! If fact, these last few weeks, it seems they’ve shrunk even more than usual. 😉 Killer popsicles! Wow, wow, wow Chris, you portray me as some sort of health freak, but I’m not that bad. It’s true that I try to eat healthy, but still if you were to offer me one of those popsicles, I would gladly accept it. I then may suggest you use honey or maple syrup instead of sugar next time you whip up a batch. But suggestions are always welcomed, right? You are def the healthy one in our wolfpack! It’s a good thing. Wear it proudly lol. Honey/maple syrup is a great idea… how do they freeze? Similiar to sugar? great job my friend, i know for sure photographing popsickle isn’t that easy actually, Salute!!! I wish I had one of these right now – it is SO hot here. I make something very similar, although I use dates instead of sugar. Love the idea of dates! These would be so god right now!! I can’t wait t try em. I think summer is the best time to get in shape. All the amazing produce is out, you naturally want to eat a little lighter, and it’s nice out so you can be more active. Good luck on your journey – you’ll do great. And, yeah, moderation is key. Life’s no fun without some treats! 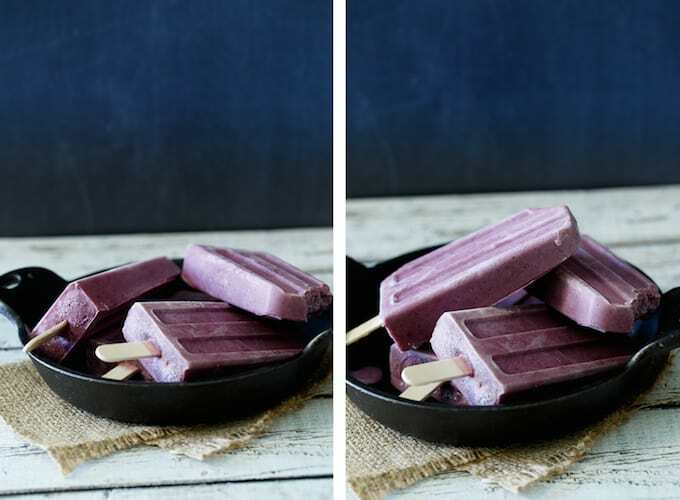 Hehe I think my clothes have shrunk lately too despite all the healthy servings of ice cream and cake I’ve been consuming 😉 I think these popsicles are just what I need instead – blueberries and greek yogurt to save the day 🙂 They look amazing! Weird right? Why do our clothes do this to us?! Yum! These look delicious! I could have 1, 2,3, or a whole popsicle set! 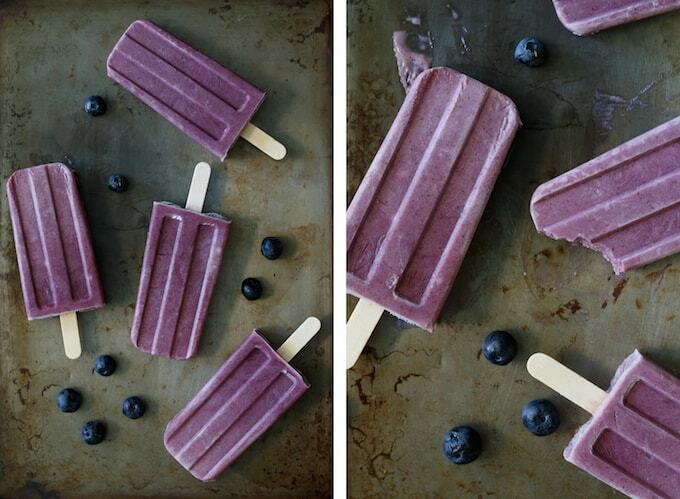 Love blueberries and definitely need to make some yogurt pops not for my little guy! Oh no! Where did you get that picture of me that’s next to my name? I swear it was one time, it was too much tequila and a stumble into a costume shop! What picture? The gravatar? That’s pulled automatically from your WordPress profile I think? Your pops always look so gorgeous and love these 5 ingredient ones, though I might have to replace that half and half with some good ol (lactose free) almond milk. Almond milk is a great idea! Hahaha yes, brushing your teeth with milkshakes is a great way to fatten up! LOVE that these have greek yogurt!!! that means I can eat like 33 without guilt, right? riiiiight. At least 33. Maybe 40. My husband calls it “closet shrinkage.” The mystery of how the size changes just by hanging clothes in the closet! What a yummy, healthy treat…and one that won’t expand the waistline! Love that! It’s official: I NEED A POPSICLE MOLD! For the win indeed! Hahaha, love your disclosure! I love the looks of these popsicles – the color is absolutely stunning! And the flavor combo is fantastic as well. Blueberry anything is my favorite! Also, how healthy are they?? What a perfect wholesome snack! I need a dozen of these! Hey, my clothes shrunk too! We must be using the same detergent that’s trying to mess with us. 😉 Gorgeous gorgeous photos! These refreshing treats look delicious (bonus that they are healthy). Have a gretat weekend Chris! Yes, the detergent. That’s it!!! Thanks Shelley! Hope you are enjoying the final days with the kids before back to school!